Need a job? Get experience! Need experience? Get a job! High school and college students sometimes feel trapped in a vicious cycle. They can’t get a job without experience, and they can’t get experience without a job. How do you write a resume if you have limited job experience? It’s not as difficult as you might think. The art of a resume is to present yourself as the best candidate for a position. For high school and college students, a strong job history is not necessary for a strong resume. Instead, you can emphasize the skills and knowledge you’ve developed in your studies, internships, volunteering, or part-time work. If your work history has nothing to do with the jobs you’re applying for, you can still highlight skills and experiences you possess that are relevant to the job you want. In this guide, we’ll show you how. Resume writing starts with brainstorming. Jot down your past jobs, internships, school projects, and volunteer work. At this stage, don’t leave anything out. Past work that seems irrelevant to your current job search, like lawn-mowing or babysitting, might still demonstrate some skills that employers are looking for. These notes don’t have to be polished. This is just information for you to refer to as you write your resume. Taking detailed notes about your past experiences now will make the resume writing process easier later on. If you’re looking for a customer service job, communication skills will be important. For an entry-level job at a bank, cash handling skills will be needed. Look over the work history notes you took in step 1. Did you use communication skills to defuse an argument between the kids you were babysitting? Or did you handle money while volunteering at a fundraising event? Write down what skills you used, and how they might relate to the job you want. This is an easy way to figure out what to put on your resume when describing your experience or skills. By customizing your resume for the job you want, you can show employers you have the skills and experience they’re looking for. See results of the NACE’s Job Outlook 2016 survey for more ideas on what employers look for in new college graduate applications. Below, we’ve listed some sample resumes that are perfect for high school and college students. Choose the resume template that works best for you. Some resumes are geared toward a specific field. Others are general purpose and work for a variety of job types. Look over the notes you took on your experience and skills. Think about what you will be putting on your resume, and choose your template accordingly. This is where the real work begins. Now, let’s learn about the basic components of a resume and how to put them together. Your resume will be divided into sections. Any resume should always include sections for Contact Information, Education, and Experience or Work History. You may not need every section on this list. Choose the ones that work best for you. That way, the resume you make will be completely unique to you. Let’s go through each section, step by step, and learn how to put them together. Your contact information should always go at the top of your resume, so that employers can easily find it. Make sure your email address is professional. It’s best to use one that includes your first and last names, not a nickname or other reference. Have a mature, appropriate voicemail greeting on your phone. The education section will likely go near the top of your resume if you’re a high school or college student. As you gain more work experience, you may move your education section farther down in your resume. If you’re a high school student, you can just put your high school name on your resume – no need to go back to middle or elementary school. If you’re in college, you don’t need to include your high school name. If you are a high schooler who has been accepted to a college already, you can also state your college’s name and the date you will begin attending. Don’t have a lot of work experience? You can talk about what you’ve learned in your courses in this section. Use a heading like “Relevant Coursework” to list classes or projects that are relevant to the job you’re applying for. Your education can show employers that you’re motivated and committed to learning, even without much work experience. A career objective statement is an optional part of your resume that acts as your “elevator pitch.” It tells an employer what you have to offer in just a few sentences. Objective statements aren’t always necessary. However, for high school and college students who don’t have a lot of work history, stating an objective is a good way to quickly indicate how their experience lines up with what the employer is seeking in a candidate. This section should be short and to the point. Let employers know, in 1-3 sentences, what your ultimate goal or objective for employment is. A common mistake when writing objective statements is talking about how the job will benefit you, rather than how you will benefit your employer. Stand out from the crowd by writing an objective that makes it clear why you’re the best choice for their business. Marketing or PR position in which I can use my Public Relations degree to gain experience and learn about the field. I have experience with a marketing internship and hope to learn more about using social media and modern PR techniques. This objective statement outlines some personal goals but doesn’t tell the employer how they would benefit by them – it only tells how the job would benefit the candidate. It’s also needlessly vague: “gain experience and learn about the field” isn’t specific enough to be of interest to employers. There’s no need to mention that you had a marketing internship in this section, as that information can go under Experience or Work History. Marketing or Public Relations position in which I can use my marketing experience to assist your business with modern PR techniques, including social media outreach, quality visual content, and online reputation management. This objective statement tells prospective employers exactly what you have to offer. It provides details that might not be found elsewhere in your resume. This is what the objective statement should do: provide specific, important information about what would make you a desirable employee. Your Work History section (or Work Experience section) will list the past jobs you’ve had. Start with the most recent one, and list each job in reverse chronological order. For each job, show the job title, the name of the company, and the length of employment. You can also include the city and state where the company is located if you’d like. It can be appropriate to list internships or volunteer work in this section, if they are relevant to the job you’re seeking. You can also leave off any jobs that are completely unrelated to the job you want. However, be careful not to leave any unexplained gaps in your work history. If you’re applying for a banking job but you worked in a restaurant for 2 years, it’s better to list the restaurant job than to make it look like you were unemployed for 2 years. Give specifics about what your responsibilities or accomplishments were at each job. Bullet points are an easy way to do this. Use two or three bullets to describe the skills you used, or how you improved the business. Here, you can describe skills or responsibilities from a past job that apply to the job you want, even if it’s in a completely different field. With this work history listing, you’ve shown that you can provide good customer service in a busy environment, learn new computer software, and reliably handle cash registers. These are all skills you might use at a banking job, even though your experience was at a restaurant. Remember to be detailed and specific in your Work History section. Saying “good customer service” is not enough. Employers want to know exactly what you did or learned so they know what you have to offer as an employee. As with your Work History section, in this section you’ll want to mention what you did, where you did it, and how long you did it for. If you didn’t have much work history to list, you could add details about specific responsibilities or skills related to your interests and activities. Just make sure it’s all relevant to your job search. These activities show commitment, responsibility, and leadership. Information like this can help employers realize that you could be the best candidate for the job. For this section, you can go back to the notes you took about your skills in steps 1 and 2. Fill out this section using the skills that relate to the job you want. Having a detailed skills section on your resume can make up for a limited work history. You don’t need to list things like email or Microsoft Word under Skills. It’s expected that students will know how to use these. However, if you’ve designed a website on WordPress, conducted interviews for the school newspaper, or have photography experience, you may want to put these on your resume. They show you have something to offer that other job seekers might not. Maybe you were in the Honor Society, or were Employee of the Month. Awards, honors, and achievements from your academics, activities, or jobs are worth listing on a resume. If you feel it would benefit your resume, you can list the contact information of up to three references. Keep in mind that no matter what it says on your resume, employers may ask you for references. You should always have at least three references available. Avoid using friends or family members as professional references. Ask former employers, professors, teachers, or coaches instead. Be sure to have handy your references’ names, phone numbers, email addresses, and places of employment, to share with prospective employers. Always make sure to stay in touch with anyone you’re actively using as a reference. Your former coach may be confused if they get a call about you from a potential employer but actually haven’t heard from you in a year. This is the final step in creating a great resume that will get you a great job. Employers will often pass up a resume that’s full of typos and mistakes, even if the content is impressive. Show employers you are detail-oriented and organized by proofreading your resume. Before sending your resume out, double check it for spelling and grammar errors. If you can, have a friend look over it to catch anything you might have missed. Keep your resume short and simple – resumes should be no more than one page. Focus on relevant skills and experiences – two weekends of mowing your neighbour’s lawn is not worth mentioning if you’re applying an accounting assistant position. Avoid needless information – your resume doesn’t need to include your elementary school, a picture of you, or other things employers won’t care about. Focus on the areas where you think you may have an edge over other candidates. Format for easy reading: the most important or newest information goes at the top, to the least important or oldest at the bottom. Use the resume template samples below to help you create your own resume. Each template comes with sample content that you will change to your own information. You should modify each example by rearranging, adding, or deleting sections to highlight your unique experience and skills. You should also look at the templates that don’t have much to do with the position you are applying for. They can still give you ideas on what to include and how to format your resume. Be sure to also check out our High School Resume Templates and Professional job-specific samples. Generic single-page resume sample to apply for internship. Resume for position of accounting assistant. Can also be modified for general office position (secretary, back office, customer service). Another sample for different types of office jobs: administrative assistant, secretary, customer service, sales. Resume for a job in a book store. Can be modified for position in any retail store. 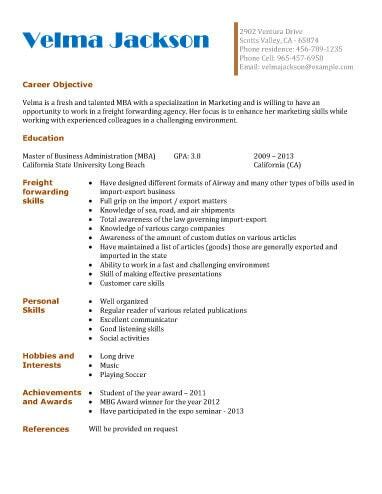 Resume sample for Customer Service representative, call center, helpdesk. Multi-purpose template with sample content. Resume for position of a teaching assistant, tutor, scholar. Resume for someone with strong technical skills in IT, or for someone looking for career in IT sector. Resume for a persone with web development skills, and knowledge of different web applications. Resume for an application for an entry-level position at freight forwarding agency. Can be easily modified for other jobs in logistics. Resume sample for medical position for a recent graduate. For a college graduate, it is understood that there is very little experience or none at all, so the format highlights education, skills, and training. Resume for someone with experience in maintaining cleanliness of food service areas and equipment.